Update 5: We Deceived You! I am sorry, it is true, we have deceived you! Don’t worry, you are being deceived by game companies all the time. It’s all part of the trick to make you want the game at an early stage of development. In our case we decided to open with an interactive version of our concept art. Looked pretty good right? Well, that’s not what our programmers are looking at from day to day. The ugly truth can be seen on the right. That is what Toki Tori 2 looks like underneath the shiny new graphics. It is a grab from Eelke’s screen as he is coding the game. The little squares in the picture are evolutionary ancestors of what will become a fully working and controllable Toki Tori. It is an ugly sight to behold but it is a necessary step for if we want to create Toki Tori 2 as we’ve envisioned. As you may have noticed, we are changing quite a lot of things as we move from Toki Tori to Toki Tori 2. 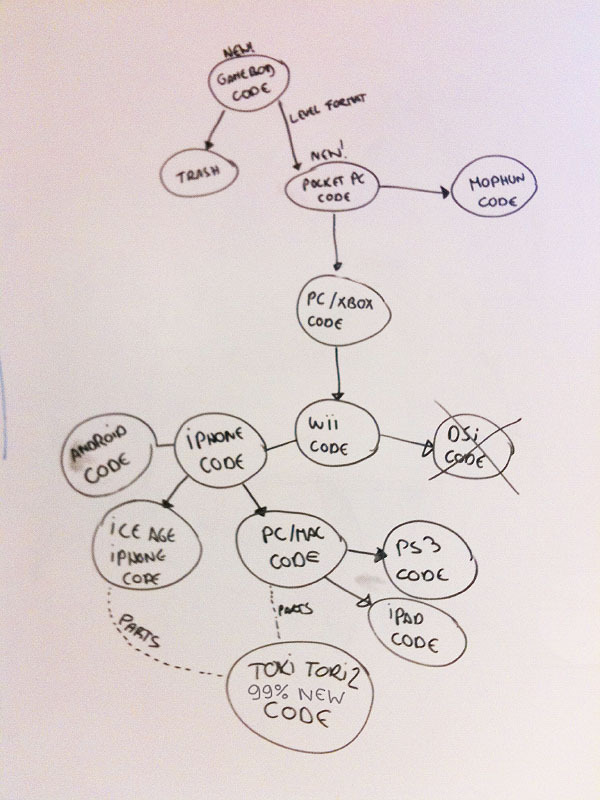 We’ve got a lot of hot-swappable technology - hence our ability to show you the interactive concept art straight away - but the core codebase for Toki Tori was, shall we say… ready for retirement. Let’s explain by using a diagram. From Game Boy to… everything else. Basically every version we’ve released of Toki Tori runs on core code originally made for the PocketPC, which is what some people used years ago before proper smartphones became available. It was time for a change, and that means going back to basics and building a proper foundation to create the game with. This is also why it will be some time before we can let you play an actual level of Toki Tori 2. So please be be patient for a while longer!